With the arrival of fall comes another football and tailgating season. While, your local grocery can provide the food for your special tailgating team and the liquor store with what is needed to warm the interior lining, the thinning of the blood however, will leave you desperately in search of the one thing you may need the most when the game is on the line: the tailgating jacket! Woolrich has combined their iconic red and black plaid with an updated style while maintaining the versatile and convenient features of their classic wool field coat. The comfortable and warm 18.5 oz weight of this wool-blend (80% wool 20% nylon) tailgate jacket will undoubtedly perform well in or out of the stadium. The classic wool field coat & pant in its red and black plaid (or the “Pennsylvania Tuxedo” as it is most affectionately known) is part of the rich heritage of Woolrich and the mastermind behind the tailgating jacket. 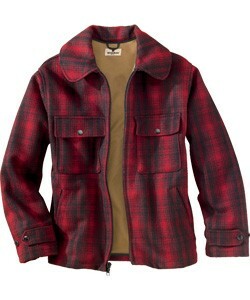 While the tailgate jacket has its own unique style, it has not abandoned its roots. 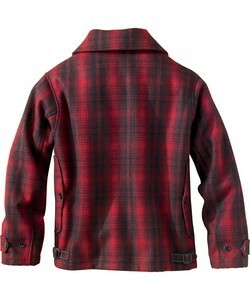 Many features are carried over from the classic wool field coat. Most notably, the “back stowage pocket” which was designed and created to store your wild game while hunting in the woods. However, the wild game from the woods that is stored in the back stowage pocket of the tailgate jacket will most likely be the Wild Turkey from the liquor store to the pre-game tailgate party, rather than wild game! On a more serious note, this back stowage pocket will be a great place to stow away your gloves, scarf, hat, and hand warmers.